DO YOU HAVE A NEW , AND THERE IS NO ONE TO IMPLEMENT THE PROJECT? The new version Newest PRO deserves special attention. Now the client has a choice of supplier quotations used. Added two new sources of liquidity Rithmic and CQG FX. Real-time quotes are now available to everyone. Previously, access to these data was only major market players (hedge funds and layout makers), with more than $ 250,000 of capital. We have implemented integration with major exchanges CME CHICAGO, NYBOT, NYSE and others. All of these features are available in the new version arbitrage softwareTrade Monitor 3.7. We took into account the wishes of each client, advanced algorithms trade arbitrage EA, added new features, improved interface. Our team for five years hard work leads to the development of new algorithms for high-frequency trading Newest PRO is the first and only arbitrage EA in the network, brought to perfection, and improving every day thanks to our customers and our experienced programmers. Profitability of the arbitrage system depends on the speed of connection to your data feed and trading terminal broker. The lower the ping, the better the performance of all arbitrage advisor. As a result of long test all four suppliers for quotations, we have identified the fastest. Quotes the number one supplier can be called Rithmic. Rithmic receives data directly from exchanges, providing instant speed data acquisition. Lagging of data feed occurs on most brokers using trading terminals MetaTrader 4, MetaTrader 5, cTrader. 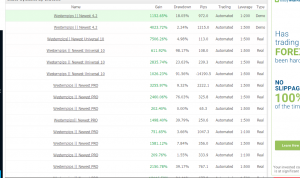 These terminals are not ideal, due to which we connect the fast quotes to the Expert Advisor Newest PRO directly from the exchange (via the Trade Monitor 3.7 program), we get the advantage, which allows us to learn the data feed 100-300 milliseconds before it appears in the broker’s terminal. 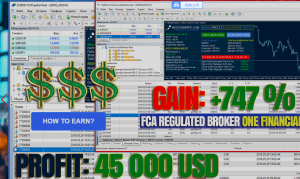 The Newest PRO EA gets fast data feed from the Trade Monitor 3.7 program every millisecond and compares them with quotations in the broker’s terminal. When there is a backlog of data feed, the trading algorithm of the expert adviser starts to work, allowing to receive the maximum profit from each signal. OF COMMUNICATION WITH MAJOR BANKS TO DEVELOP API / FIX TRADING. Below are the monitoring, reporting and trading advisors examples in real-time. After seeing them you can plunge into the world of high-frequency trading and to feel the spirit of this profitable trade. All reports and monitorings only with live accounts, real investors. Good luck watching! After-sale technical support of the clientunlimited number of time. The help in control and installation of the adviser on the VPS server of the client. 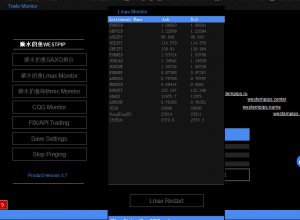 To connect to the data feed (Rithmic, CQG, Saxo Bank, Lmax Exchange) you will need your login and password. To do this, open a demo or live account in your chosen data feed agent. If you register a real account, you’ll need a minimum deposit: $ 500 for Rithmic, on CQG $ 250, $ 1000 on Lmax Exchange, at Saxo Bank $ 10,000).Also for connection to Lmax Exchange debits from the account of $ 60 a month, Rithmic $ 100 a month, CQG FX and Saxo Bank can use for free. Ping – a connection speed of dada feed agent or with a broker. The lower the ping, the faster the speed of dada feed agent. Advisor to work requires a minimum ping to dada feed. To do this, you need to select the optimum location VPS server. Starting with version 3.7, I recommend using two VPS server. One in London (for the stock Lmax Exchange and Saxo Bank), another in Chicago (for the stock Rithmic and CQG). In this case, you’ll work on the zero ping. 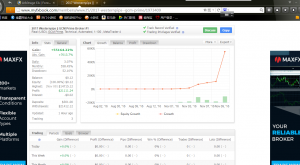 Next you need to check where the broker’s server on which you are trading. If America is to work with this broker on a server in Chicago, if the broker’s server is located in Europe or Asia, then to work with this broker on the server in London. If you are Australian or New Zealand broker. Rent a VPS in Australia. wp.waterforex.com	| Theme: news-vibrant by CodeVibrant.